Bob had winter holiday the last part of February and we combined that with our annual wedding anniversary trip and set of for Tuscany. The train ride to Florence from Gorizia, Italy is 5 ½ hours with a transfer in Udine. We were amazed that so many people were riding the train. 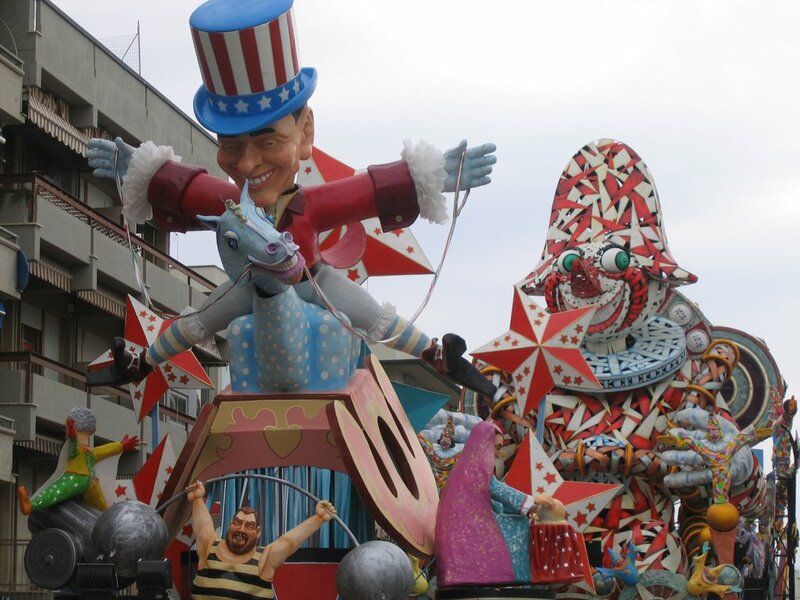 Every seat was taken with families, workers, business types, and elderly ladies alone, but very few non-Italians. Bob’s fascination with trains and train travel is heightened every time we travel. There are no high-speed bullet trains like in France, but the coaches are comfortable and the views are beautiful. We have not had this problem ourselves, but we know of people who have forgotten to stamp their tickets before entering the train and they have had to pay an additional fare on the train, so we are constantly reminding each other to punch the ticket in the little orange box on the platform. I was 19 years old the last time I visited. The advantage of ancient Italian cities is that they don’t change much over the years, but the city did seem busier with more cars, more modern businesses and high scale shops than I remember. I think maybe the changes have been mine. We heard more American English in Florence than we have heard in the past 6 months. Many American universities have study abroad programs in Florence and their presence has been an assistance to the Florentine economy. The universities have purchased buildings for classes and provided apartments for their students, and of course the students are out and about spending money on eating, playing and other necessities of living in an historical community. Their presence is really evident with the number of carryout pizza deli’s and racks of potato chips with cold cokes. We stayed just outside the old walls of the city, an easy walk to the Duomo and other attractions. We spent a long time just wandering the city, watching the sunsets over the Arno river from the Ponte Vecchio, peering into doorways that lead to hidden gardens and courtyards, entering churches that have been standing for 800 years and glancing at the tourist wares in the market. If I more than glanced in the market I was accosted by the sellers throwing out multiple languages until I reacted, and then they tried to charm me in perfect English. We attended morning Ash Wednesday mass in the Duomo with 60 other s in a church built to seat thousands. As much as I am pulled to visit churches when I travel, the experience of sharing the intention of the building is much more meaningful than walking through as if in a museum. The vision and devotion of the faithful echoes and dances in the walls of a church and their energy is much more present when joined with others seeking the Spirit. The search for understanding of the spiritual is everywhere in ancient Florence; in the altars set high in the corner of buildings, in the frescoes that cover the walls of every church, in the paintings that decorate the walls and the sculpture that are housed in the niches. A space that really spoke to me in an ancient tongue was the courtyard of the confraternity of Il Chriostro dello Scalzo on via Cavour. A doorway like so many others leads into a courtyard enclosed with a skylight illuminating drawings of the life of John the Baptist on the walls. 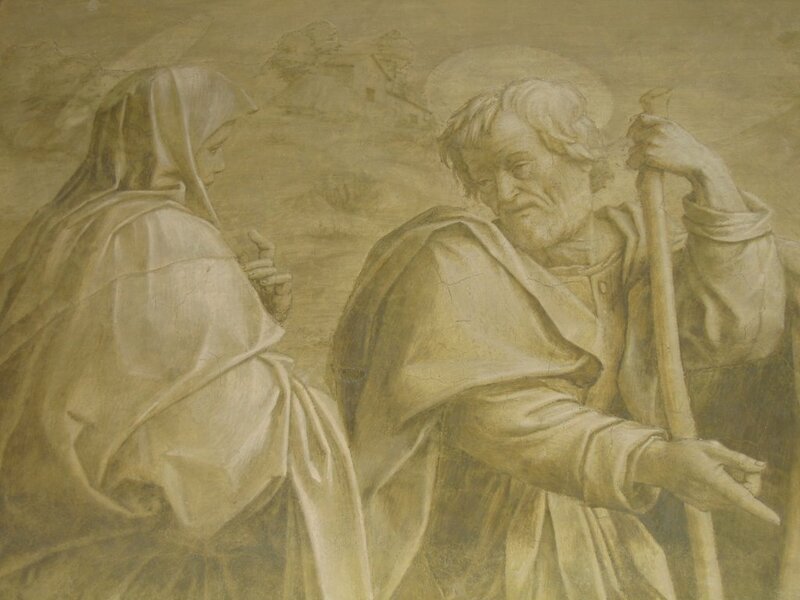 The fresco images were created during the years 1509 – 1526 and have the look of monochromatic oil pastel. 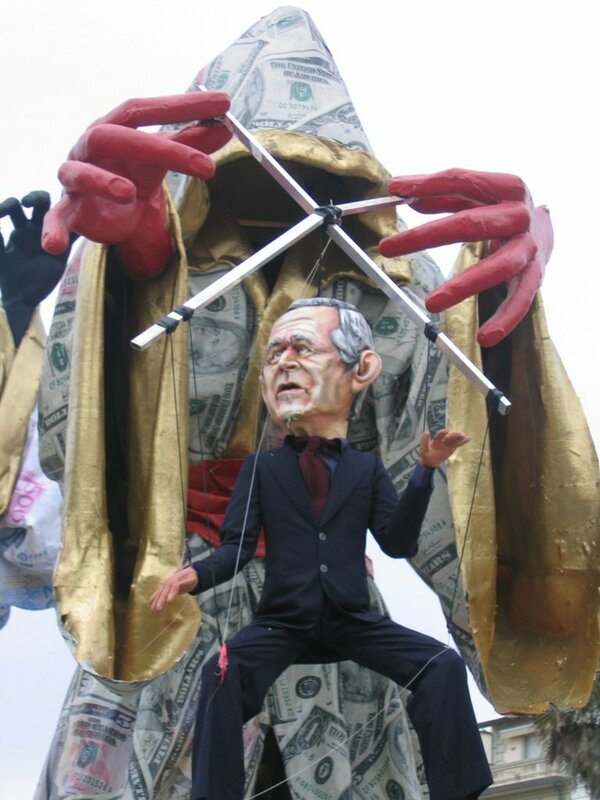 The figures reflect the honest look of the people of the time; faces with wrinkles, double chins and tired eyes. So many of the glorious paintings we see in other spaces are the aggrandizement of the body or the soul of the individual. The holy faces have a classic beauty, sculpted perfection or the nearly naked bodies are the study of the muscular structure, but here in this little hidden wonder the people of the countryside 500 years ago look out from their pensive thoughts and daily happenings. We had an early morning viewing of Michelagelo’s David alone in the Accademia; there are no lines at 8:15am. The enormity and the beauty of that sculpture are breathtaking, but I delight even more in the unfinished pieces and the struggle of the lives trying to free themselves from the rock. I have read and reread The Agony and the Ecstasy by Irving Stone. In his recreation of the life of Michelangelo the young sculptor broke from tradition and chose the piece of marble by the life he saw within the stone. These souls forever jailed in stone rage against their captivity are calling to be freed 500 years after they were first discovered. 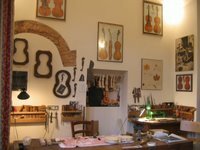 Also in this museum is the first pianoforte made by Christopho in 1700. While in the employ as a court musician of the Medici he created this new instrument to be able to control the dynamics of his playing. The first instrument has not been restored and is in the same condition it was when it was found in a 20th century attic. There are so many churches around the city with brown block undecorated fronts. We were confused as to why they looked unfinished. The holes for the scaffolding were left open and now house the pigeons when it rains. Was this the result of WWII destruction? All the bridges except the Arno were destroyed, could the facades of the churches been damaged too? 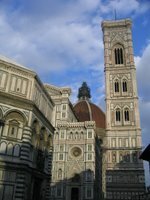 A visit to the Museo dell’Opera del Duomo helped us understand that the churches took forever to complete and some still remain naked and unfinished. The façade of Santa Maria del Fiore – the Duomo, looked the same until the end of the 19th century. 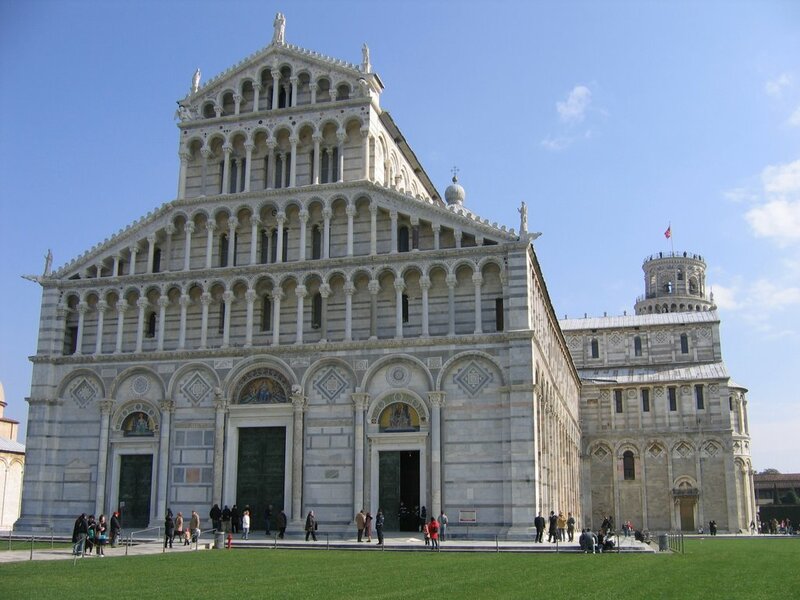 The cathedral was begun in the 13th century on the site of an existing church that continued to serve the parish while the Duomo was being built around it. 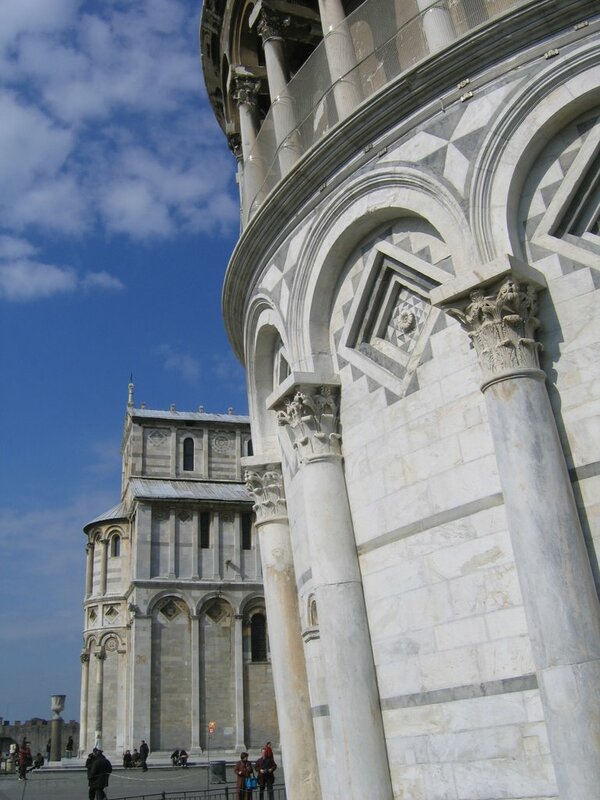 The lower portion of the façade was completed, but left unfinished until the 1580’s when the Medici’s had it removed with the intent of completing the façade. It remained unfinished until the design of Emil de Fabris was chosen in the 1800’s and it was completed in 1887. The museum shows the designs that were proposed over the years and the drawings of other submissions that competed with the Fabis design. In addition to viewing the original art that was created for the Duomo the study of the evolution of the building is fascinating. 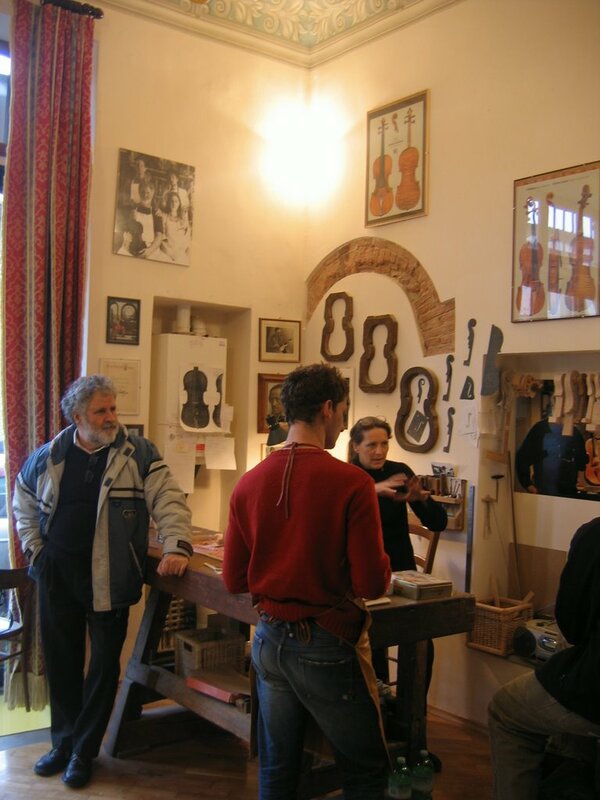 A high light of the trip was visiting the violin workshop of Paolo Vettori e Figli. We met Paolo and Milica in Nova Gorica and visited them in their new location near to our hotel and across the street from the sculpture garden where Michelangelo worked. 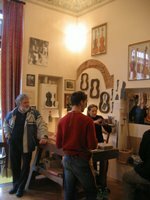 Paolo, Dario, and Lapo create around two dozen hand made instruments each year using ancient wood rescued from an old barn. They have restored the carriage house of an old palace for the workshop and show room. Their vision to mold this space to meet their needs included digging a basement room from the inside. It was done mostly by hand with shovel and buckets filling 80 trucks with rubble. The front room where Dario and Lapo work has a sunny ceiling painting, large front wall of glass, a spiral staircase to the loft and the new basement and a window that opens to the back garden courtyard. They have molds and designs mounted on the walls, a glass showcase of recently made instruments and very very fine spruce dust everywhere from the detail finishing with tiny thumb planes and 1200 grade fine sand paper. 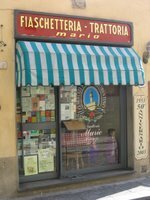 We went to Fiaschetteria-Trattoria Mario for lunch. 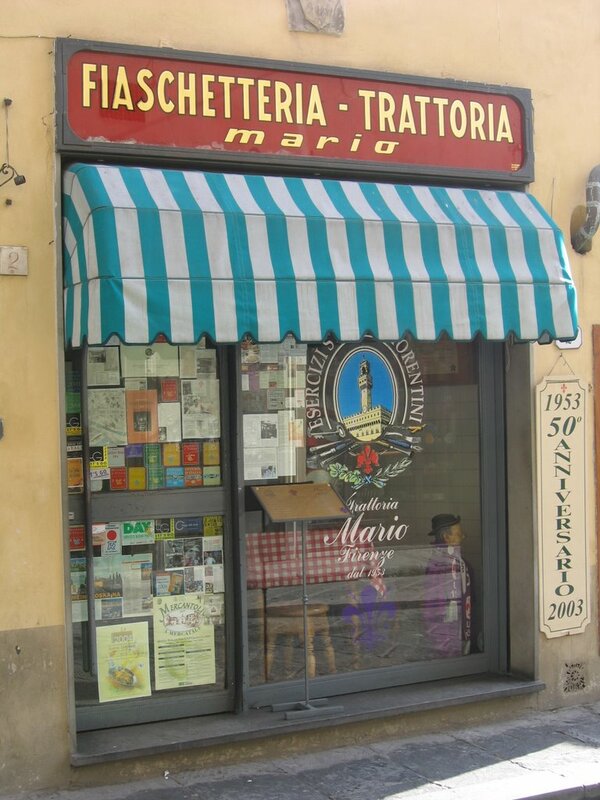 This typical Florentine local restaurant has been serving home cooked meals since 1953. 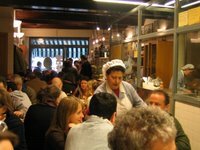 The space is crowded with tables, the cooking happens behind a glass wall in plain view, regulars greet the family cooks by name, tourists watch wide eyed as this circus of serving delicious and fast lunches unfolds in record speed with the song of laughter everywhere. Bob shared a Florentine steak with the Vettori family and melted with the taste of the biggest hunk of rare meat I have ever seen at table. He couldn’t stop saying how wonderful it tasted. 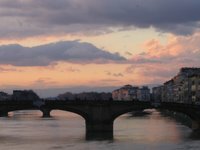 I enjoyed the prima course of pasta and then salad, grilled peppers, potatoes, local wine and finished with biscotti dipped in a liqueur and a light fluffy Florentine cake [I think all the traditional foods are called Florentine]. The bread in Florence though has great texture, but a very bland taste, no salt. Like everything else in Florence there is history in the bread too. 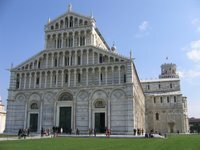 800 years ago Pisa was a port city because the Arno was wide and deep enough for sea vessels to travel. The tariffs on salt imposed by the Pisans were so high that the Florentines refused to buy the salt and therefore began making bread without salt. Now 800 years later the tradition continues. For those of us who are fascinated by tradition it oozes from every pour of this city. On Shrove Tuesday we traveled by train to Pisa and then to Viareggio. 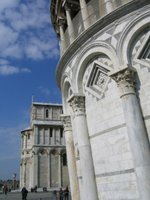 The best thing about Pisa is that the tower still leans and tourists come to see and feel the amazing energy within these walls. The crystal white buildings shimmer in the sun framed by the royal green grass and the rough blocks of the city walls. 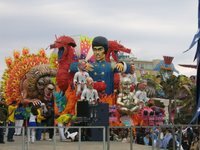 We then trained to Viareggio for the carnievale and the gigantic parade of floats. The city is a beach town on the Mediterranean coast with miles and miles of soft sandy beach. 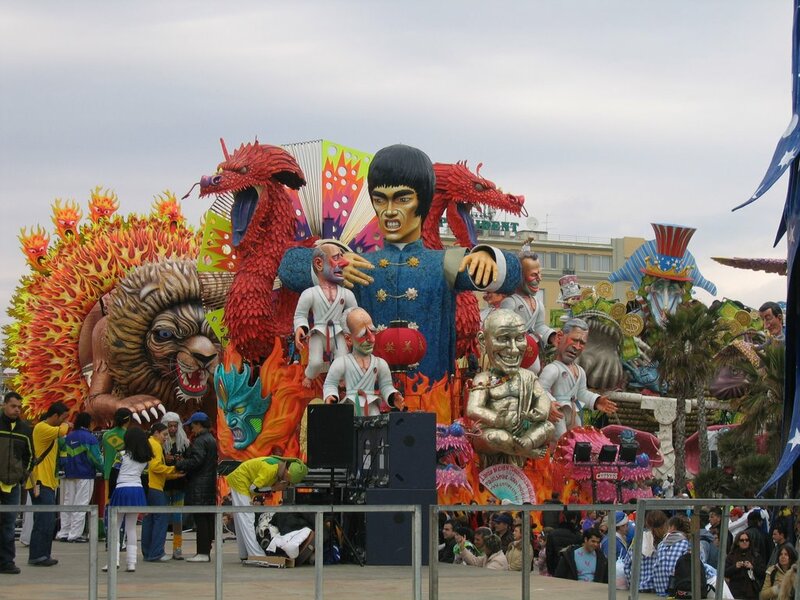 The parade takes place on the street along the beach and people gathered are in a rich array of costumes. 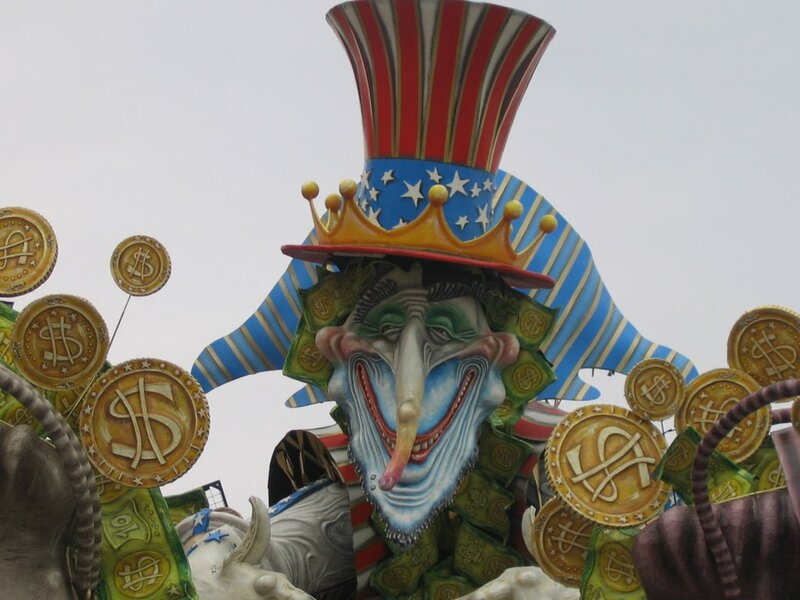 There were none of the wealthy elaborate costumes of Venice, but many families were adorned with funny hats, masks, glasses and silly costumes. 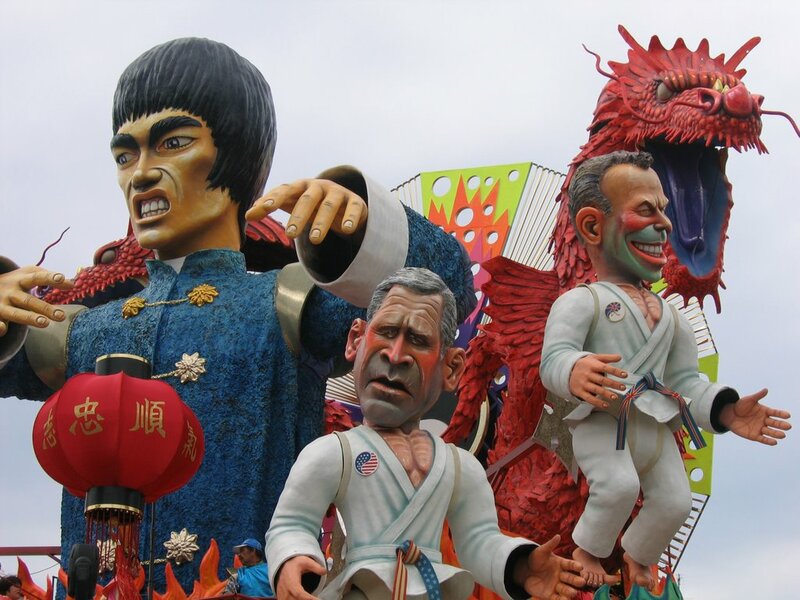 Most of the floats had national and international political statements. The face of George W. was clearly the most popular image with strong statements about American politics. We greatly enjoy going to places in Italy, but the Slovenes we know are not as excited about things Italian. In this area where the fascists had control for 25 years the people still have long resentments that their names were changed, that they were not allowed to speak their own language and that the Italians were awarded cities and land that had always been traditionally Slovene. Some boys at school were telling Bob that when the Slovenian partisans were fighting WWII in this area they could have moved further into Italy, but because of natural and cultural borders they chose to stay in the area where Slavic languages were spoken, but that consideration was not given to the people when the allies drew the boundaries. Resentments live on for generations.